I saw this and couldn’t help but bring it to your attention. Designed by Italian architect firm Boeri Studio Stefano Boeri, Gianandrea Barreca and Giovanni La Varra and being constructed in design capital Milan. 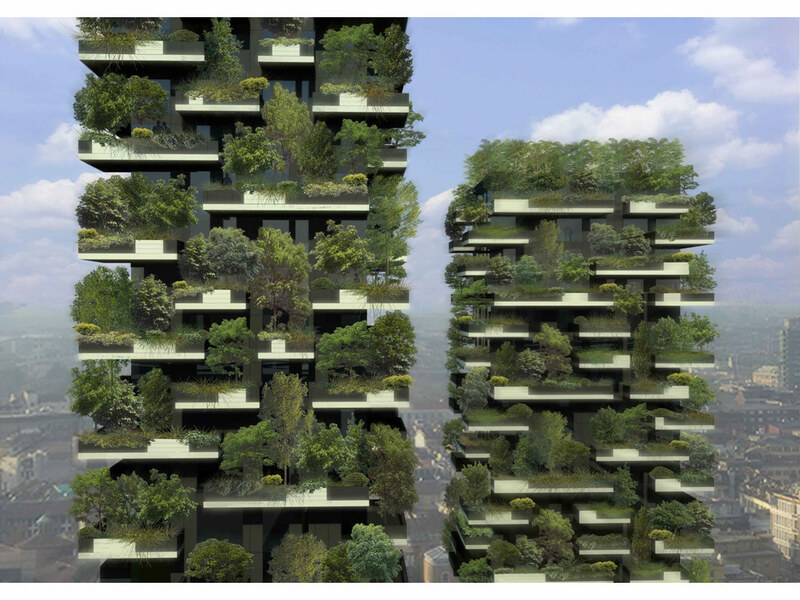 The first example of a Bosco Verticale composed of two residential towers of 110 and 76 metres height, will be realised in the centre of Milan, on the edge of the Isola neighbourhood and will host 900 trees (each measuring three, six or nine metres tall) apart from a wide range of shrubs and floral plants. According to the architects website, on flat land each Bosco Verticale equals, in the amount of trees, an area equal to 10,000sqm of forest. This story has caused so much interest I thought I would update it with another image lifted from the architect’s own website where more images can be found. 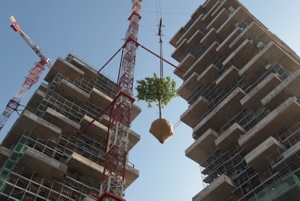 The pictures clearly shows building well underway and trees being hoisted into position. It is worth pointing out that the architect Stefano Boeri has a well-respected body of work. The following is an excerpt from Laura’s response via LinkedIn to some of the questions raised. Milano is not such a windy city, fortunately. By the way, we have calculated with two different steps held in two wind galleries (Milano and Miami) forces acting on trees, on the building and transferred by the trees to the building. With the help of prof. Ruck from Freiburg University (Germany) we calculated forces acting on trees, then forces helped us to define a right dimensioning of the trees. Trees will be maintained by a single company because they are not ‘private’ trees, the ‘pots’ are properties of all the owners. Irrigation system is splitted, every single pot is indipendent and checked by a remote position. The water is recycled. More from Laura Gatti in answer to some of the comments and criticisms raised. Terraces are 3 meters wide, lenght is different; containers are 1.1 meter (internal measure) wide, lenght is different, depth is 1 meter plus 10 cm of aeration layer at the bottom; 3,5-5,5 cubic meters of soil are available for every tallest tree . Weight of the containers – soil (designed for this project: three different layers changing in organic compound content and porosity)+ trees + forces acting on the building has been a big challenge, surely ! Our structural engineers (ARUP ITALIA) carefully calculated them and adviced for a special reinforce of the slab (post-tension technic) avoiding to increase the slab height. Safety: a summary of different strategies a) designing in-built containers b) choosing the right species; c) choosing the proper individual tree (without structural defects); d) growing the choosen trees in the nursery two years in advance and checking their health and their root system ; e) choosing the soil with proper geotechnical properties; f) installing three different anchoring systems (young rootball, crown, rootball); g) planning for a maintenance program. I’ll bring your best wishes to our trees …. we have planned for an annual pruning . Keeping the crown dimensions in the safety limits is crucial and you are right, weak branches could become a problem and have to be checked. People working on that trees shall be qualified arborists (EAC/ISA certified) and an ispection is already planned every two-three months – depending on the season (first two years) and every four months (after the first two years). I can’t be absolutely sure about the future (I’m not telling you I have no idea, but only that I have to be extremely cautious): but if maintenance will be done properly, I can imagine that the trees will grow very well initially and after some years they will grow very slowly, as every plant in container does. I don’t have a crystal ball but I have observed trees in container since years. As trees, we choose species like Acer campestre, Fagus sylvatica (north sides), Prunus subhirtella, Parrotia persica, Quercus ilex. It was also important to choose trees that don’t lose their natural appearance when pruned. Isn’t it going to be extremely dark in the occupied central spaces? the designer obviously doesn’t realise what happens when the wind blows at altitude! How can you write “On flat land, each Bosco Verticale equals, in the amount of trees, an area equal to 10.000 sqm of forest”? Are you serious? Have you ever been in 10.000 sqm of “forest” in a park? Do you really think it is the same? the statement is taken from the architects website rather than eing my opinion. Perhaps I should edit my words to reflect that. ACtually, 10,000m2 (or 1 hectare) is not that large an area (100m by 100m). Standing the middle, you still see through the trees into the rest of the park/roads or whatever is outside. While I will be interested in seeing how the project matures, it is better than what is currently happening with high rise buildings planted with 10 saplings near the entrance, in the shade usually, and looking rather forlorn. Cut and paste is a wonderful thing! Quite apart from the effect of wind on shallow rooted, top heavy, trees, they will also bend out towards the light. It’s likely to look a lot more like an overgrown Xmas tree. But someone is presumably pouring money into making this happen. Let’s just hope it’s not more Eu money. This is just a totally ludicrous proposal in my opinion. How on earth do the occupiers/owners/tenants replace trees that fail, as some are bound to do. What happens in autumn when they all shed their leaves? What happens in years to come when trees grow old and become unsafe? ‘Stop the world, I want to get off’ comes to mind. Well I have to suppose the architect has considered all these questions but just to check I’ll drop him an email and ask him to respond. What was the architect’s response to all those questions, please? I have just updated the post with a response from the projects landscape consultant. I love trees, but that certainly looks quite a dangerous and inappropriate idea to me. Why do so many people think high density housing has to be high rise when research shows that terraced housing is just as high density. I support “Smart growth” (See PP news item from last week). Why don’t they use the numerous systems available for ‘green walls’ instead, there would be a lot less maintenance involved and the habitable rooms wouldn’t be so dark!! I think having shrubs and creepers in planters would be much easier to handle .it is also likely to cost much less in terms of maintenance and can be relpced easily also this would be as effective as trees in terms of supply of oxygen . Are these going to attracts swarms of birds such as starlings?? think of the mess below! Yuk! I have to agree with Ken assessment here. I would love to see the bid for the continuous maintenance this project will entail because of the bird excrement being produced daily onto terraces, walls, glass windows below the boxes, etc. Newton’s Third Law of Motion: for every action there is an equal and opposite re-action. In this case, the re-action caused by the original intention of making this a “green building” may prove to be too much for the intended purposes of the trees and the public living inside and/or around the building. What these Italians will do to bring attention to themselves! It’s an interesting concept and I’d be interested to see how it works in years to come. It’s just a shame that nearly every comment above is critical of it. I agree Sue. Having lived in apartments with no green space or little access locally to anything green, I think this is very positive. Lets give it a chance. If nobody tried anything innovative for fear of upsetting forums, we would live in very banal cities. Change is good…You go first! This is in my humble opinion the kind of cynism and idiotic idea that modern man comes up with and has nothing to do with what I understand by being “green”. It only shows how man ridicules and has little real understanding of the serious message of being seen to be environmentally friendly. This kind of architecture has nothing what so ever to contribute to Organic Architecture and has everything to to with cheap sensationalism and is an affront and belittles the serious business of Environmentalism something I fought very hard for all my 33 years as one of the few truly “green” professional gardeners of this sad beautiful planet…..
Like I do mention in my website we ( presently under reconstruction)need to not only think globally act locally but increasingly act logically! For possible examples of what I understand by Organic Architecture please visit in person such buildings like the HQ of NMB formally ING Bank and Dutch Gas which are in my view real attempts at what is possible when people with a real interest in Environmentalism, the welfare of their staff and their corporate image can do. There are examples such as these all over the world and need to be studied and discussed. They may not be to everyone’s taste but that is a question of taste. For a foretaste of what is to come please visit http://www.architectureguide.nl. Its a great ground breaking (ground-leaving) concept albeit fraught with potential problems as already pointed out. However, if no one tries to break the mold mankind will forever be jelly shaped, so good luck to them. But for trees to flourish and for the concept to work I believe that they will need a bonsai expert on their team, an annual expense they may not have factored in. And there are other definitions of green other than yours, Jean-Laurent. I really like this idea. I’m sure the architect has put a great deal of thought into this and has planned, tested and spoke with arboricultural consultants and engineers to make sure this can become a reality. I’m all for it. Very exciting. Are there any more updates? I will see if I can get an update. Interesting idea. I agree with Clive Morgan, though, that a bonsai expert will be critical to the trees’ success. As the crowns of these trees grow, so will their root systems, and if you only prune the crowns you’ll still be fuelling their regrowth with the root systems of the larger plant, unless root pruning is also carried out to keep crown and roots in balance. I like the idea of trying to put trees where people live. The concern I have is that most of the “LEED” type certifications seem to be more about marketing “green” products than being sustainable. There are many good water saving and energy saving techniques used. But, for example, when we consider solar, we cut down our shade trees so the solar panels on the roof can receive sunlight in order to supply more air conditioning at a lower energy rate. While both green and sustainable are current buzz words, the definition of sustainable has to include affordable, and return on investment, not just pouring monthly/annual maintenance expenditures to keep the trees existing in their new environment. I am curious of the monthly maintenance fees, and who the apartments are targeted or marketed to in the society. With the proposed maintenance plans, it seems like it will be a higher level of income than non-skilled workers, or subsidized living. If it is not sustainable, then call it what it is, an expensive place to live with a lot of greenery on each floor. I wish people would pay this much attention to our trees in our communities that are growing in the ground.